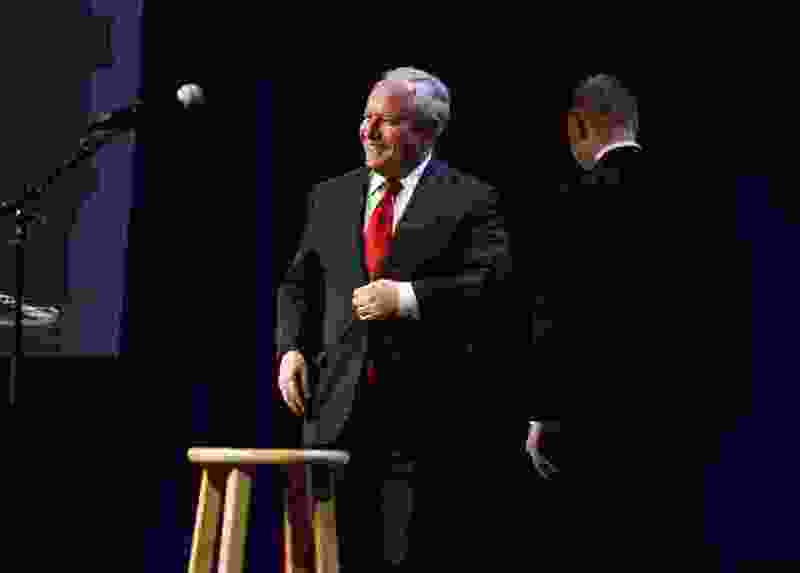 (Scott Sommerdorf | The Salt Lake Tribune) Conservative pundit Bill Kristol takes the stage to deliver the keynote address at the Sutherland Institute's Annual Gala, Friday, November 3, 2017. The standard, so to speak, interpretation of the demise of the Weekly Standard is that it is symbolic of the fate of non-Trumpian conservatism. There is something to this analysis, but it is too neat by half. The Standard did not shutter its doors on Friday because it was rejected in the marketplace of ideas. Like most publications, it had lost print circulation in recent years but gained online readership. It did not make a penny of profit, but then magazines of ideas seldom do. They depend on wealthy patrons who will subsidize the losses to promote their worldview — and themselves. From its founding in 1995 until 2009, the Weekly Standard’s owner was Rupert Murdoch. But after buying the Wall Street Journal in 2007, Murdoch presumably saw no need for a small magazine to exert influence in Washington, so he sold it to another conservative billionaire — Philip Anschutz of Denver. Anschutz had already created a conservative newspaper known as the Washington Examiner. So now he and Ryan McKibben, the chief executive of Anschutz's Clarity Media Group, want to focus their resources on taking the Examiner national instead of supporting the Weekly Standard. The Examiner is friendlier to President Donald Trump than is the Standard, so it's easier to explain to their Republican friends. But it is not clear to what extent that factored into their decision. John Podhoretz, one of the magazine's co-founders, tweeted: "It actually wasn't about Trump, or only about Trump on the margins. This was far more in the nature of a weird personal vendetta." There's nothing unusual about a rich owner losing interest in one of his playthings. What makes this case more tragic and infuriating is that Anschutz and McKibben refused entreaties from the Weekly Standard's editor, Stephen Hayes, to sell the magazine. Rather than allow the magazine to live under new ownership, Anschutz and McKibben murdered it to harvest its subscriber list for the Examiner. So a talented staff of journalists is being thrown out of work just before Christmas in an act that is equal parts destructive, stupid and cruel. The Standardites hope to reopen under a new name and with a new owner. Whether that happens, the Weekly Standard is no more, and it is appropriate to mourn its passing even while hoping for a rebirth. The Weekly Standard was, of course, a conservative magazine, but it is quite possible not to agree with some or even much of what it stood for while still appreciating its feisty editorials, fine reporting, elegant writing, witty satires, and a “back of the book” that offered serious book reviews, unpretentious film reviews, and cultural commentary from the likes of Podhoretz and Joseph Epstein. An awful lot of talented journalists have written for the Standard over the years, including Fred Barnes, David Brooks, Andy Ferguson, Matt Labash, Charles Krauthammer, David Frum, P.J. O’Rourke — and even Tucker Carlson in his pre-demagogic days. The Weekly Standard was run for most of its history by Bill Kristol — a good friend who is gifted with an ironic disposition and a cheerful temperament. While he is a well-known conservative, Kristol is hardly doctrinaire. He opened the Standard to all sorts of viewpoints — many of them entirely apolitical — and then led it into fierce, principled opposition when Trump seized control of the right. I devoutly hope a new Standard will arise to lead the Republican Party out of the moral and political oblivion to which the president is consigning it.